I decided because I seem to spend so much time hunting for interesting things on the net I'd pick out my favourite find each week. Might be a photo, a place, an idea... anything. 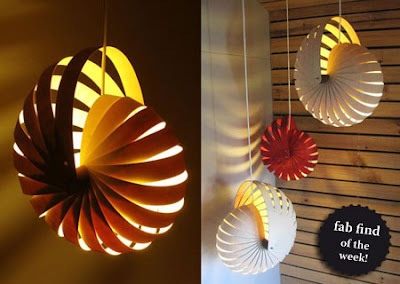 So to kick it off what really caught my attention the past week was this fabulous Nautilus Light by New Zealand designer Rebecca Asquith. Prices start from NZ$460.00 and they ship worldwide.